JT mesh import (without LODs). Option to import multiple models into a single document. Assembly structure is now displayed also for mesh-only files. 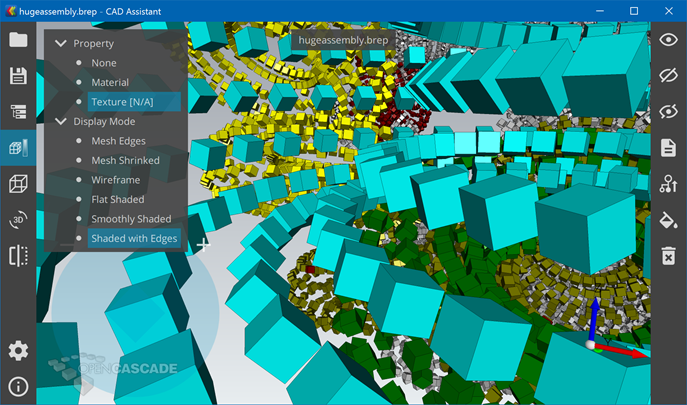 Improved performance while displaying big assemblies. Improved glTF mesh format support. Support of polygons with more than 4 nodes within mesh import. Option to control nodes merging for STL mesh import. Option to rotate around a picked point. Option to use shaded mode for highlighting a selected object. OPEN CASCADE CAD Assistant for Android is an offline viewer and converter for 3D CAD files and meshes. The application supports BREP, IGES and STEP file formats, allows to view and export CAD models and meshes (in PLY, STL, OBJ or glTF formats). JT meshes can also be viewed starting from version 0.9. Meshes can be viewed in wireframe, shaded and shrink modes. Manipulation of a 3D view is intuitive and performed by finger gestures, a user-friendly toolbar and menus make application control an easy task. SD card is fully supported. CAD models can be saved to STEP, IGES, or BREP format as CAD data; CAD and mesh models can be saved to PLY, STL, OBJ or glTF format as polygonal data. Model images can be saved to PNG format. If Mail is selected as the target directory, the mail client will be automatically started with the saved file as an attachment. OPEN CASCADE is an Information Technology Company of Capgemini. OPEN CASCADE provides services in the domain of scientific and technical computing, particularly in the integration of simulation tools.